This is the the second piece in the series "Sea Forest" done in a palette that mimics the natural world in colour and feel. An abstract expressionistic piece that hearkens to an earlier time, of atmospheric cloud formations, of shapes and moments that weave the viewer into it's story. This is the first piece in the series "Sea Forest". The palette is phtalo greens mixed with natural pigments like raw umber, burnt sienna and raw sienna. You can see the influence of current modern abstract expressionists in my work but also those like Turner. You can see a castle tower in the mid right hand side of the painting - not something I planned at all. I love the way abstract expressionistic pieces speak to you in their own way and how it is a dialogue between the piece and the viewer. Each piece has it's own narrative to whisper through the eyes of whomever enters it's space. "Enough!" 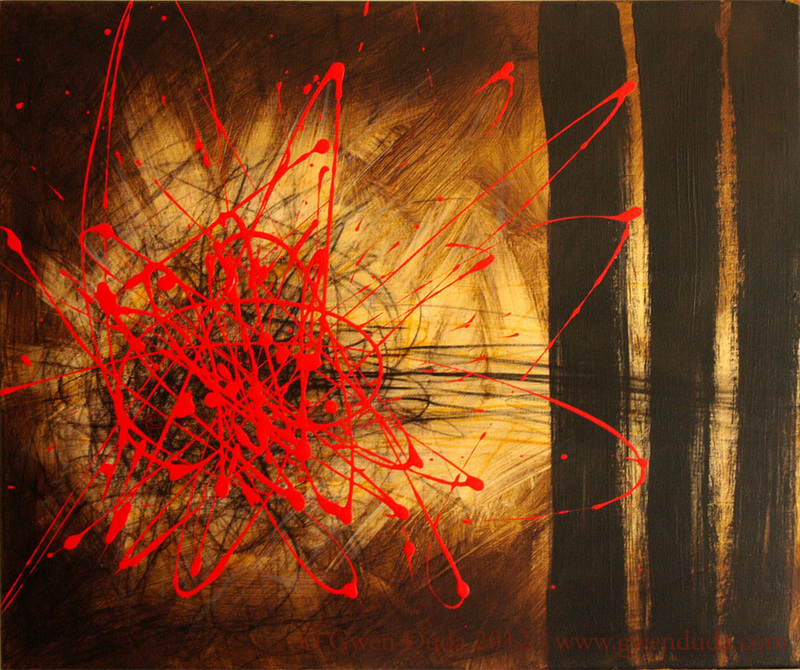 is an expressionistic abstract that is born out of energy being continually frustrated by obstacles. Everyone has their area or areas of frustration. For myself, it has been dealing with chronic illness that has sapped my energy and stamina for over two decades. You are limited by what you can physically do. Time and time again opportunities have to be forgone. Sometimes I can manage that and other times it's just too much. "Enough!" is the expression of that. 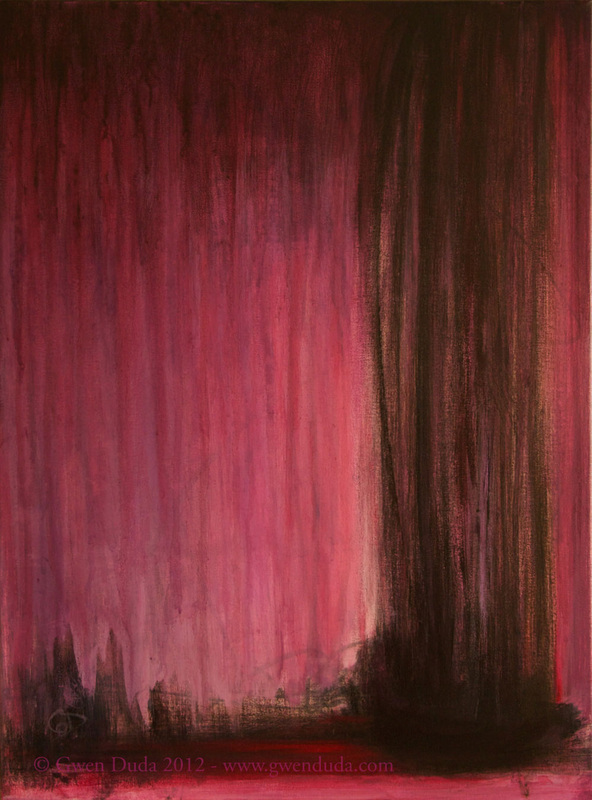 "Love Falls Down" is another expressionistic abstract that visually illustrates the recognition that no matter how hard we try, at some point, those we love we will let down in some way, or they will let us down at some point in our lives. We don't mean to but it happens. We get back up, lift up our love once again, and carry on. This image came into my mind's eye as to what that looks like, when love falters, for that moment. But all is not lost, for love is buoyant and eternal. 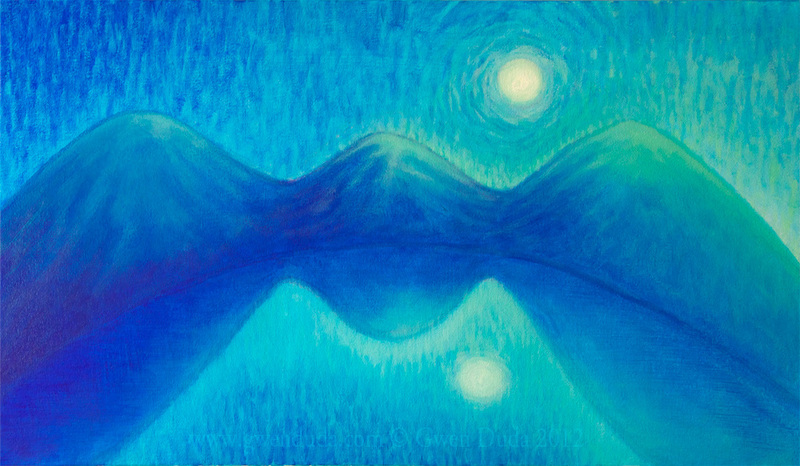 "Vibrant Serenity" is inspired by the Group of Seven, specifically Tom Thomson and even though she wasn't of the Group of Seven, Emily Carr. Their work speaks words that breathe life into my artist's soul. I was also impressed by Van Gogh's lively brush work that seemed to animate the very air he attempted to capture in his natural countryside and city scenes. Being a Canadian, born and raised and having lived 42 years on what can be the frigid prairies and having spent time in the Rockies, I mean, what else could I possibly be or paint?! This image is cool, lively, vibrant and peaceful all at once, just like the awe-inspiring magnificent stillness that stirs our inner being as we watch the moon rise over our magnificent Canadian natural splendour! "Oak Glory" is another in the series of Nature paintings that I have done every fall for the last two years. These paintings take an incredible amount of time from the selecting the leaves from the ground (I don't like to pick any leaves that are green, I usually wait till fall to do my leaf collecting) and from those selecting a grouping that will work together, imagining their placement and the series as a whole. Then comes the pushing and pulling of the paint, the printing process (as I use the leaves to both print onto the canvas as well as to be a stencil). It's a very time consuming process but VERY worthwhile in the end product. If you would like to see the process in action, please go here. 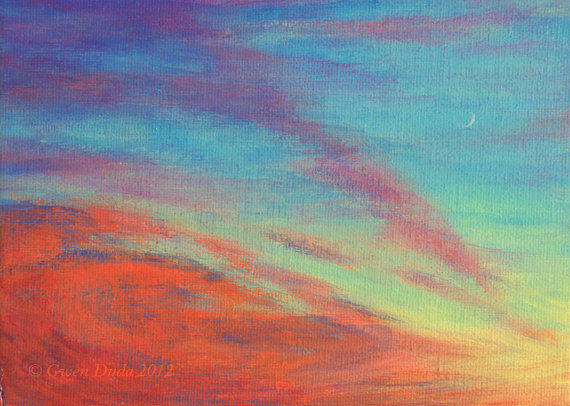 This is a commissioned small oil painting (ACEO sized 3 1/2" x 2 1/2"). 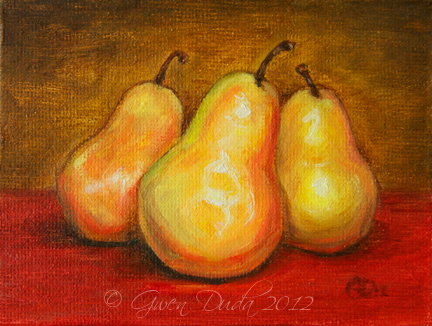 Subject matter is three sumptuous pears on a vintage red table top. I can't help but think of Rembrandt's works as the colour palette is in an earth tone palette for the majority of it's execution. Vibrant, earthy, luminous. I think it turned out beautifully and the client/collector loved it.